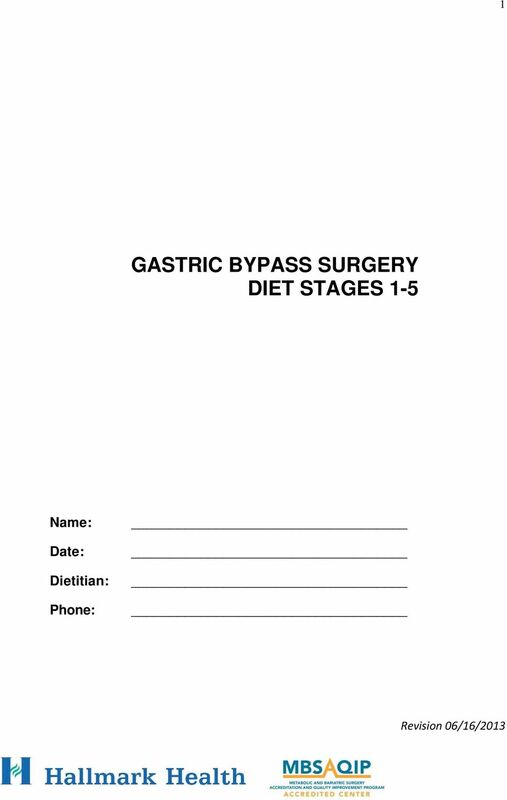 Download "GASTRIC BYPASS SURGERY DIET STAGES 1-5"
4 4 Post Surgical Diet As a result of gastric bypass surger, the size of the stomach is reduced and the length of the actively digesting small bowel is shortened. This can help promote weight loss by making it difficult to eat too much food at one time and by causing a feeling of fullness after very small meals. However surgery itself will not lead to weight loss. The way you eat after surgery must be permanently altered. Initially, both the consistency and the volume of food will be restricted to allow for healing, while providing essential nutrients. Your long-term goal is to continue to restrict the volume of food while providing a more nutritionally balanced intake. 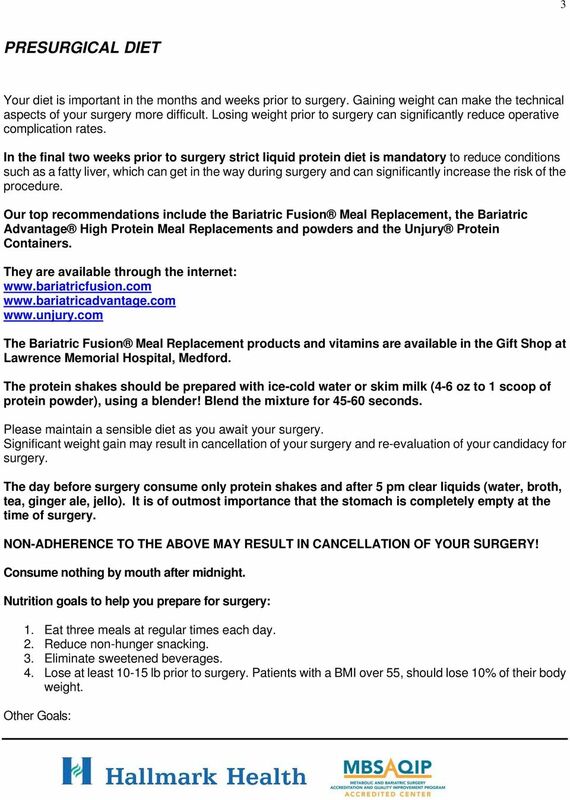 These guidelines will provide you with information to help you modify your intake and maximize the benefits of surgery. Problems may arise after surgery. Some of these will go away with time, while others can be controlled with adjustments of the diet. Below are some guidelines to help you to prevent or minimize these problems. 1. Always eat or drink very slowly. Meals should be paced to last about 30 minutes even when the amount is very small. Eating too quickly may cause nausea and vomiting. 2. Chew food thoroughly. All food should be chewed to a liquid consistency while in the mouth. Food that is not thoroughly chewed can cause nausea and vomiting or may cause blockages in outlets. 3. 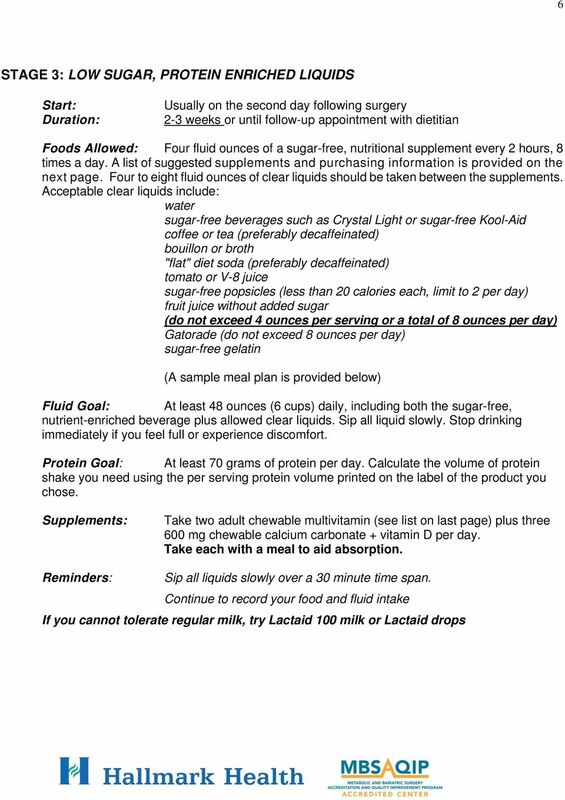 Eat foods or beverages only in the amounts suggested. Eating larger amounts may cause vomiting, weight gain, expansion and even rupture of the stomach. 4. Do not drink with meals, instead only 30 to 60 minutes before or after meals. This may overload the stomach causing nausea and vomiting, and also may cause expansion and rupture of the stomach. 5. Drink plenty of fluids. Without adequate fluids, the body will become dehydrated, especially if vomiting or diarrhea occurs. To prevent dehydration, drink 3 to 4 ounces of water or other acceptable low-calorie beverages between meals. 6. Avoid foods that contain a lot of sugar. High sugar foods include puddings, ice cream, cakes, pies, cookies, and soda. Eating these foods may cause a condition known as dumping syndrome which occurs when food passes too quickly from the stomach to the small intestine. Symptoms may include a combination of nausea, uncomfortable fullness, cramping, diarrhea, weakness, sweating, and fast heart rate. Reduce your intake of sweets and notify your doctor if these symptoms occur. High sugar foods are also often high in calories but contain few nutrients, and thus, may affect the nutritional adequacy of your diet and your ability to lose weight. 5 5 7. Note foods that are not tolerated. Many people cannot tolerate red meat, milk or high-fiber foods after surgery. Food intolerances can lead to stomach discomfort, nausea or diarrhea. If milk is not tolerated, try Lactaid milk, Lactaid pills, or a lactose-free nutritional supplement. If a food is not tolerated, eliminate it and then try it again in a small amount a week later. Try only one new food at a time. 8. 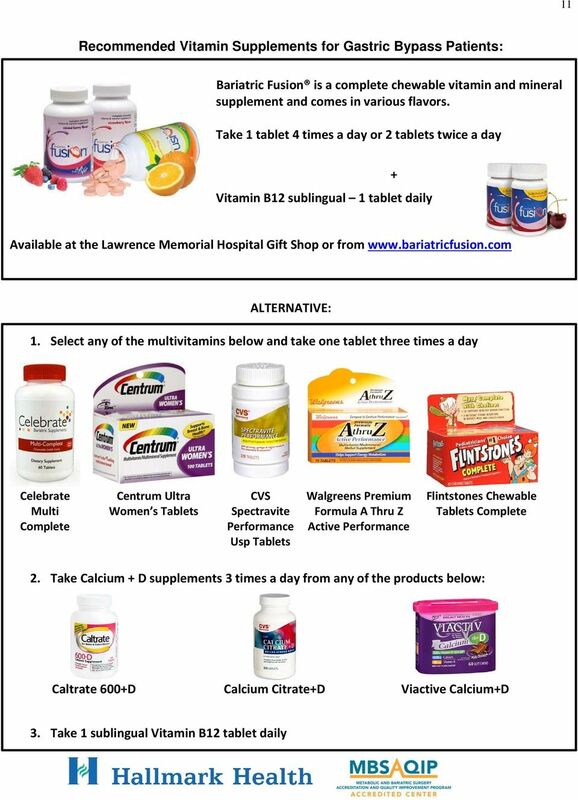 Always take the vitamin and minerals supplements prescribed. 9. 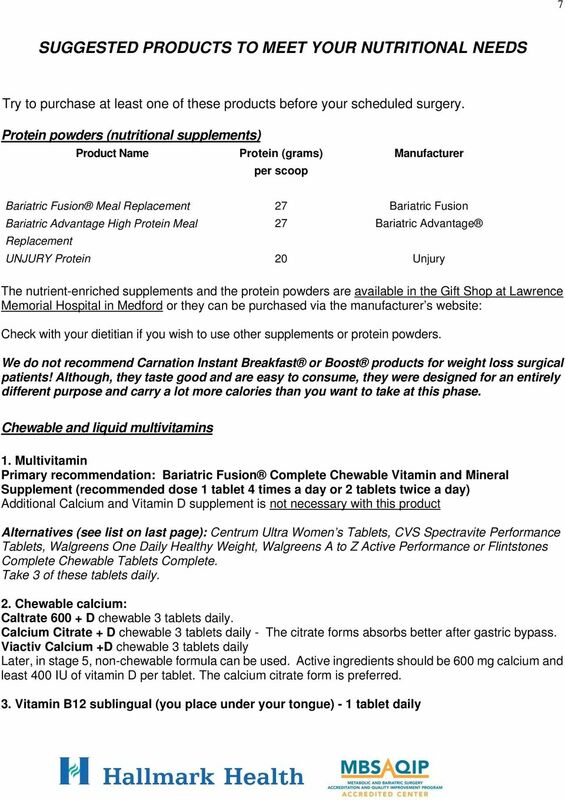 Purchase recommended vitamins, minerals and liquid supplements prior to surgery. 10. Maintain the diet that is recommended for your recovery stage. 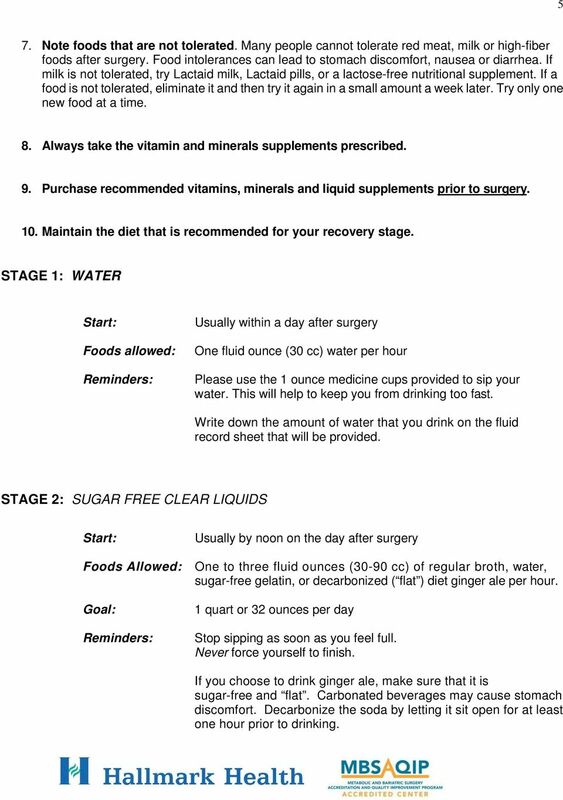 STAGE 1: WATER Start: Foods allowed: Reminders: Usually within a day after surgery One fluid ounce (30 cc) water per hour Please use the 1 ounce medicine cups provided to sip your water. This will help to keep you from drinking too fast. Write down the amount of water that you drink on the fluid record sheet that will be provided. STAGE 2: SUGAR FREE CLEAR LIQUIDS Start: Foods Allowed: Goal: Reminders: Usually by noon on the day after surgery One to three fluid ounces (30-90 cc) of regular broth, water, sugar-free gelatin, or decarbonized ( flat ) diet ginger ale per hour. 1 quart or 32 ounces per day Stop sipping as soon as you feel full. Never force yourself to finish. If you choose to drink ginger ale, make sure that it is sugar-free and flat. Carbonated beverages may cause stomach discomfort. Decarbonize the soda by letting it sit open for at least one hour prior to drinking. 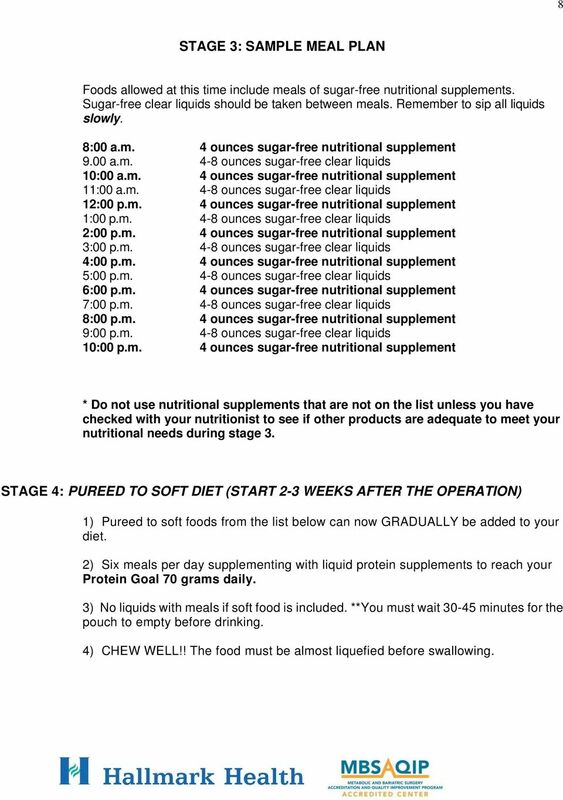 8 8 STAGE 3: SAMPLE MEAL PLAN Foods allowed at this time include meals of sugar-free nutritional supplements. Sugar-free clear liquids should be taken between meals. Remember to sip all liquids slowly. 8:00 a.m. 4 ounces sugar-free nutritional supplement 9.00 a.m. 4-8 ounces sugar-free clear liquids 10:00 a.m. 4 ounces sugar-free nutritional supplement 11:00 a.m. 4-8 ounces sugar-free clear liquids 12:00 p.m. 4 ounces sugar-free nutritional supplement 1:00 p.m. 4-8 ounces sugar-free clear liquids 2:00 p.m. 4 ounces sugar-free nutritional supplement 3:00 p.m. 4-8 ounces sugar-free clear liquids 4:00 p.m. 4 ounces sugar-free nutritional supplement 5:00 p.m. 4-8 ounces sugar-free clear liquids 6:00 p.m. 4 ounces sugar-free nutritional supplement 7:00 p.m. 4-8 ounces sugar-free clear liquids 8:00 p.m. 4 ounces sugar-free nutritional supplement 9:00 p.m. 4-8 ounces sugar-free clear liquids 10:00 p.m. 4 ounces sugar-free nutritional supplement * Do not use nutritional supplements that are not on the list unless you have checked with your nutritionist to see if other products are adequate to meet your nutritional needs during stage 3. 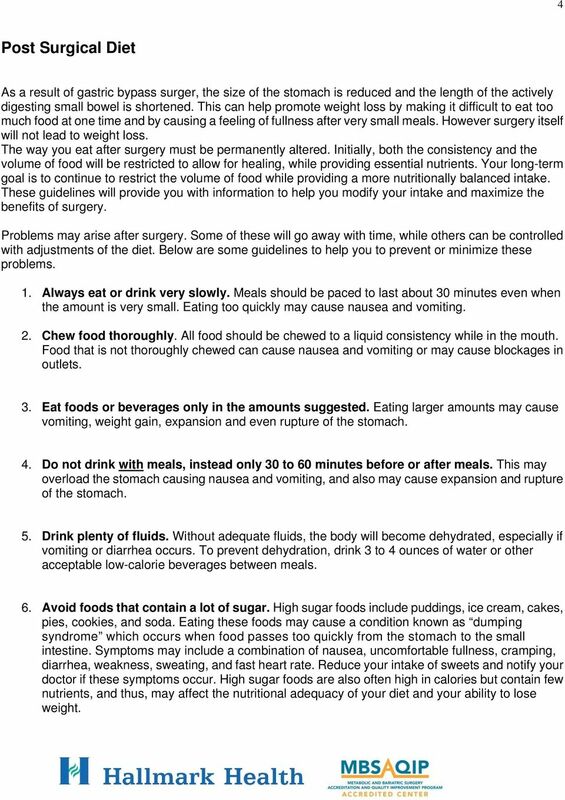 STAGE 4: PUREED TO SOFT DIET (START 2-3 WEEKS AFTER THE OPERATION) 1) Pureed to soft foods from the list below can now GRADUALLY be added to your diet. 2) Six meals per day supplementing with liquid protein supplements to reach your Protein Goal 70 grams daily. 3) No liquids with meals if soft food is included. **You must wait minutes for the pouch to empty before drinking. 4) CHEW WELL!! The food must be almost liquefied before swallowing. 9 9 PUREED TO SOFT DIET (do not combine food selections!) > One item from below for designated meal only On WEEK 3 gradually try: Blenderized soup Oatmeal, grits, cream of wheat Scrambled eggs Cottage cheese Yogurt with fruit pieces Soft fruit (banana, melon, strawberries) Soft Vegetables cooked well (skinless) Soft cooked eggs, chopped/ground well Toast or crackers with peanut butter Light white fish, such as haddock or scrod Please remember, if you have pain or vomit after trying something new, return to liquid diet for 24 hours before resuming stage 4 diet. Don t get discouraged if you vomit after trying something new. Take a note of it and you may try it again in 2-3 weeks. 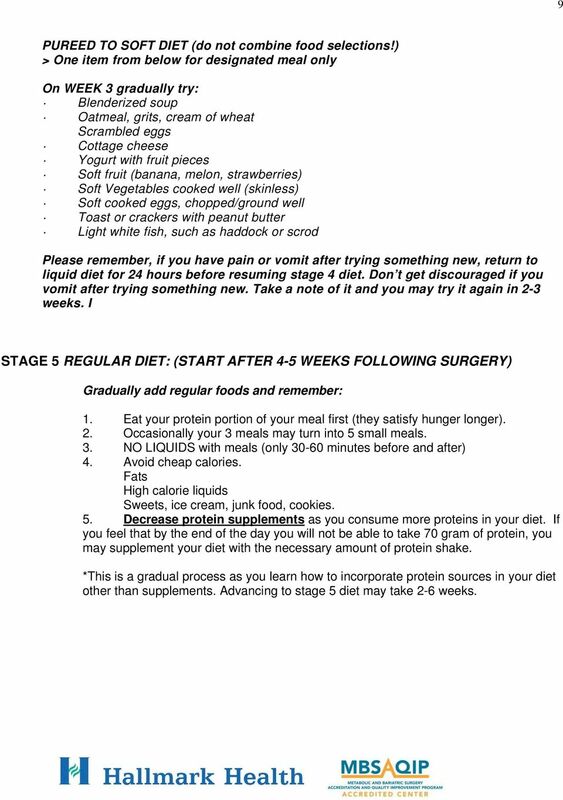 I STAGE 5 REGULAR DIET: (START AFTER 4-5 WEEKS FOLLOWING SURGERY) Gradually add regular foods and remember: 1. Eat your protein portion of your meal first (they satisfy hunger longer). 2. Occasionally your 3 meals may turn into 5 small meals. 3. NO LIQUIDS with meals (only minutes before and after) 4. Avoid cheap calories. Fats High calorie liquids Sweets, ice cream, junk food, cookies. 5. Decrease protein supplements as you consume more proteins in your diet. If you feel that by the end of the day you will not be able to take 70 gram of protein, you may supplement your diet with the necessary amount of protein shake. *This is a gradual process as you learn how to incorporate protein sources in your diet other than supplements. Advancing to stage 5 diet may take 2-6 weeks. 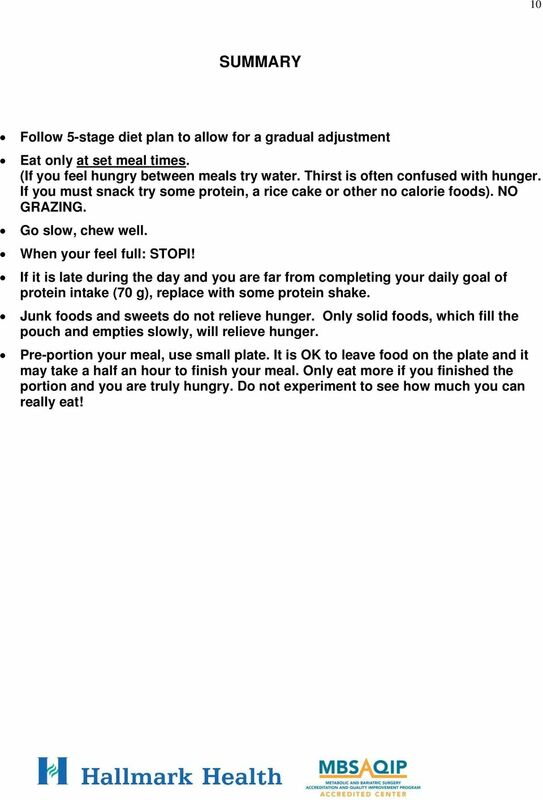 10 10 SUMMARY Follow 5-stage diet plan to allow for a gradual adjustment Eat only at set meal times. (If you feel hungry between meals try water. Thirst is often confused with hunger. If you must snack try some protein, a rice cake or other no calorie foods). NO GRAZING. Go slow, chew well. When your feel full: STOPI! If it is late during the day and you are far from completing your daily goal of protein intake (70 g), replace with some protein shake. Junk foods and sweets do not relieve hunger. Only solid foods, which fill the pouch and empties slowly, will relieve hunger. Pre-portion your meal, use small plate. It is OK to leave food on the plate and it may take a half an hour to finish your meal. Only eat more if you finished the portion and you are truly hungry. Do not experiment to see how much you can really eat! 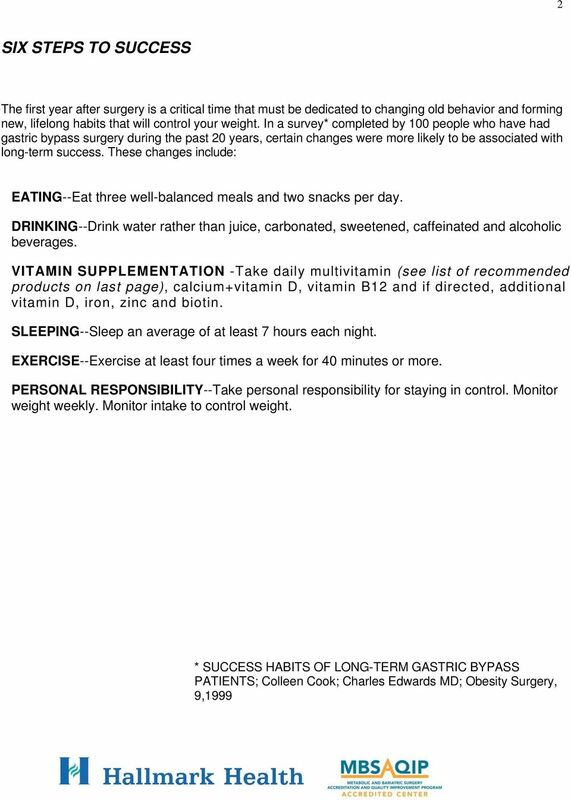 GASTRIC SLEEVE INSTRUCTIONS 3-6 months after surgery What you are likely to be experiencing Appetite you are probably getting hungry on most days, though not necessarily for 3 regular meals every day. Please read the instructions 6 days before your colonoscopy.